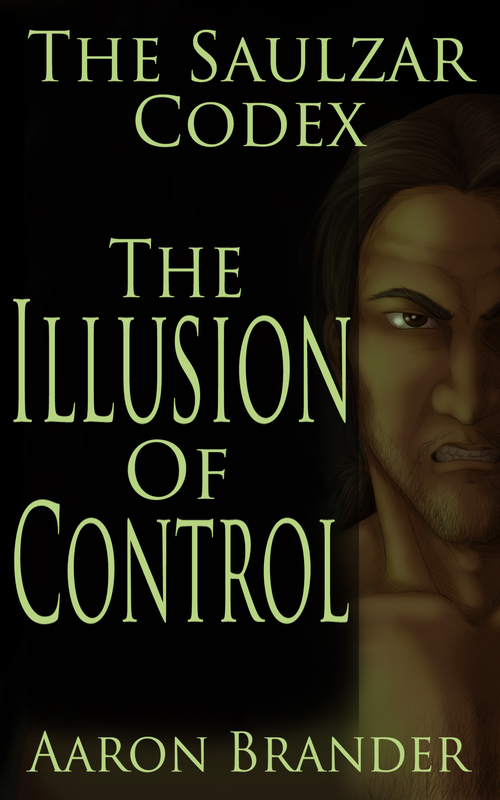 I’m happy to announce that The Illusion of Control is available! It is the third chapter in the Saulzar Codex – a series of short stories focusing on Saulzar, a fierce warrior battling to overcome his own past. You can learn more about the project here. I’d love for you to stop by and pick it up. It’s a short story at 9400 words and is priced at $0.99. His wolves hunted. They were concealed on both sides of the Karka, a tributary of the Poi. The river was not wide, about eighty feet where he knelt, but it flowed deep and cold. Across the river, hidden among the tall reeds that grew on the banks of the river, were Smudge, Snarl and Lefty. “Is that it, do you think?” Flint asked, for the third time that hour. Flint was a jumpy man, though all the time he spent building explosives gave him an excuse. Saulzar shielded his eyes against the sun and turned his gaze downstream. Flint was right. “That’s the one.” The boat was wide with a shallow draft. It looked like a pig wallowing in mud as it crawled around a bend. “How do you know?” Coal asked. Coal and Flint were brothers and shared many traits, their inability to sit still was one, their penchant for questions another. Saulzar took a deep breath to keep his temper under control. Hunger, his blood-craving scimitar, flared into the gap in his mental defense, and he shook off the image of Coal’s head tumbling from his body. These were his men. They were good men, and their company staved off the call of his sword. “You can see all that, can you?” Flint squinted into the sun. “You’ve spent too much time underground, Flint,” Saulzar said. “Or diddlin’ his pecker, he has,” Coal said. Flint swung a fist at him. Coal ducked and rammed his head into Flint’s chest. They hit the ground, throwing ineffectual punches until Saulzar grabbed both by the necks in his iron grip. They stopped struggling immediately for they knew their leader’s temper. “Sorry, boss,” Flint said and Coal echoed. Saulzar shook his head. Saulzar gazed across the river and saw Smudge’s ugly, squished face staring across the gap. Saulzar put his arm out to the right with his fist closed, and then flashed it open twice. Smudge copied him, and Saulzar knew that he and Snarl would do their job when the boat arrived. Smudge had joined the Wolves a year before, running from an accusation of murder. He didn’t say much about it, nor much ever, but after Saulzar saw him fight for the first time he had Lord Edward look into Smudge’s past. He discovered that Smudge got into a bar fight with a squadron of guards that ended with the guards bloody and broken. The boat continued its slow journey upriver. Upon the deck, Saulzar could make out people now. Two on each side plied their long poles, pushing the boat upriver. An equal number stood on watch, bows in hand. Upon the forecastle, under a canopy, stood the captain and two armed men. Minutes passed slowly, the mumbling of the river and the noisy breathing of Coal the only sound. Saulzar growled in answer, low and menacing. He willed the boat faster so they could begin. Coal and Flint swatted at gnats that swarmed around their faces. Saulzar could see their agitation and hoped they could hold out for a few minutes more.